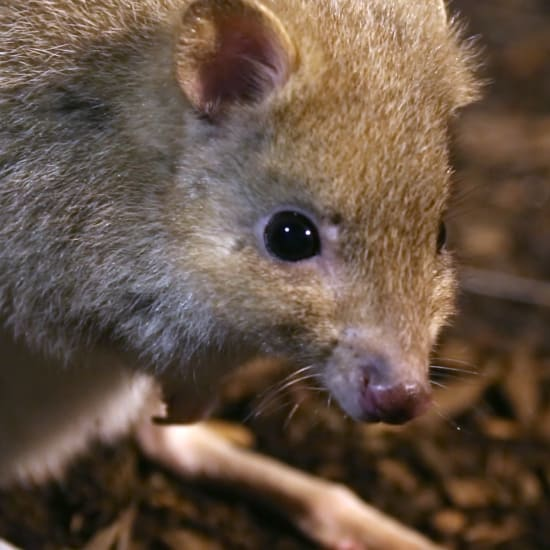 Eastern Bettongs, also rather unflatteringly known as rat kangaroos because of the way they move using low, springy hops, are in the same family as the better known potoroo and now extinct Desert Rat-kangaroo. Like other shy Australian animals, Eastern Bettongs are nocturnal, preferring to spend their daylight hours holed up in leaf-litter lined nests in the ground. At night they feast on a variety of foods but truffles are a firm favourite. Their constant scratchings play an important role in their backyards, helping to reduce fuel loads by aiding decomposition and assisting with the dispersal of fungi and plants. Thanks to the introduction of the Red Fox and feral cats they no longer hang out on the mainland of Australia. We need your help to get the bounce back into their gait. Eastern Bettongs were once common across mainland Australia but are now restricted to Tasmania where their remaining population has suffered alarming declines. A small reintroduced population also lives within a predator-proof fence in the ACT. Eastern Bettongs are approximately the size of a rabbit, with long tails roughly equal to their body in length. During the day they sleep in well-camouflaged nests which consist of depressions in the ground, lined with leaf litter. All Bettongs have the endearing habit of carrying nesting material with their curved, prehensile tails. At night they leave their burrows to feed on roots, tubers, leaves, insects, fruits and seeds, but truffles are the true delicacy. Their feeding escapades can carry them up to 1.5km in a single evening. A large distance for such a small critter. One thing in the bettongs favour is their ability to reproduce at any time of year, with gestation lasting only three weeks, and a single young produced each time. This means that given the right conditions, populations of Eastern Bettongs could regroup relatively quickly. Eastern Bettongs have lost a significant part of their habitat due to land clearing and the introduction of predators like Red foxes and Feral cats. They are also suffering from extensive and ongoing loss of habitat. We want these little ecological engineers to remain a part of our landscape and be free to do what they do best – help create a healthier landscape. We are therefore working to create new habitat for them and to relink existing habitat so they can move more easily across Tasmania again in search of food, homes and partners. Our ultimate aim to provide sufficient habitat and protection for them to be in reintroduced to mainland Australia. a) $5,000: We will be able to plant trees and shrubs to create one hectare of new habitat for Eastern Bettongs in Tasmania. b) $20,000: We will be able to restore and link up two patches of bush to create larger areas of new Eastern Bettong habitat up to 5 hectares. c) $100,000 +: What we’d really love to do is create 6,000 hectares of wildlife corridors across the Tasmania to allow populations of Eastern Bettongs to expand and thrive. Greening Australia are tackling this one, working in partnership with local landholders and scientists across the Tasmanian Midlands. Scientists are studying the Eastern Bettongs to understand how they use the landscape and what they need in their new homes to survive and escape feral cats Landholders are in turn allowing seedlings to be planted on their land to create new homes for bettongs. To date, 1,000 hectares of habitat have been restored with a further 5,000 hectares to go.